How far will Egypt's new constitution change the position of women? A Coptic Christian group has rejected a report by Egypt's official statistics agency which estimated the community's population at 5.13 million. 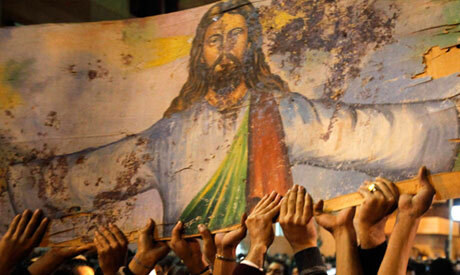 The Coptic Church estimates the community at 15-18 million, the Copts of Egypt Coalition said in a statement on Tuesday. The Church's statistics are more reliable than those of the Central Agency for Public Mobilisation and Statistics (CAPMAS), because it carries out population density checks every three months, the coalition said. Non-Orthodox Churches, which make up 5 per cent of Christians in Egypt, also carry out similar checks, the coalition added. The 5.13 million figure quoted by CAPMAS is actually the number of Copts living abroad, not the number living inside Egypt, according to the coalition. The report, published by CAPMAS head Abu-Bakr Al-Gendy, could affect the status of Christians under the new constitution which is being drated these days, the coalition asserted. Gihan Sadat, wife of former president Anwar Sadat, stated during her husband's rule that Coptic Christians in Egypt numbered around 6 million, the coalition claimed, at a time when the total population was 51.7 million. The current Egyptian population is around 85 million. I can tell you as a tourist and visitor to Egypt that from my experience - cities visited across Egypt, number of churches and monasteries and just random selection of people I happened to ask a question on the street/airport/hotel/shops etc an estimate of 10 million is too low. There are a lot of Copts and we all know that when Pope Shenouda asked Sadat to conduct a census on their true number, it resulted in him being exiled. Getting real numbers from Egyptian state agencies is still a long way off. We all know that the Copts are a distinct ethnicity and the indigenous population of Egypt. They are not Arabs and have tried their best to preserve the last stage of the ancient Egyptian language. Denial of their rights is one thing but denial of their very existence is a smack in the face of all Pharaonic history to date. The ARAB Republic of Egypt has a lot to answer for. but regardless of the actual number, even if there were only one Copt left in Egypt, the Copt culture runs deep in Egypt. Remember, all what the Arab brought with them from Arabia were the religion and language the rest from Architeture, cuisines, customs, sciences and arts came from the Copts. Even Islam as we know it in Egypt has a Coptic flavour. So does it really matter how many Copts living in Egypt today to recognize this proud part of our culture? Copts have a tendency to inflate their numbers. If Copts were 15-18 million, we would have seen up to 100 Coptic Lawmakers elected in the last election. Only few Coptic lawmakers were actually elected, which suggests the relatively low size of Coptic population.